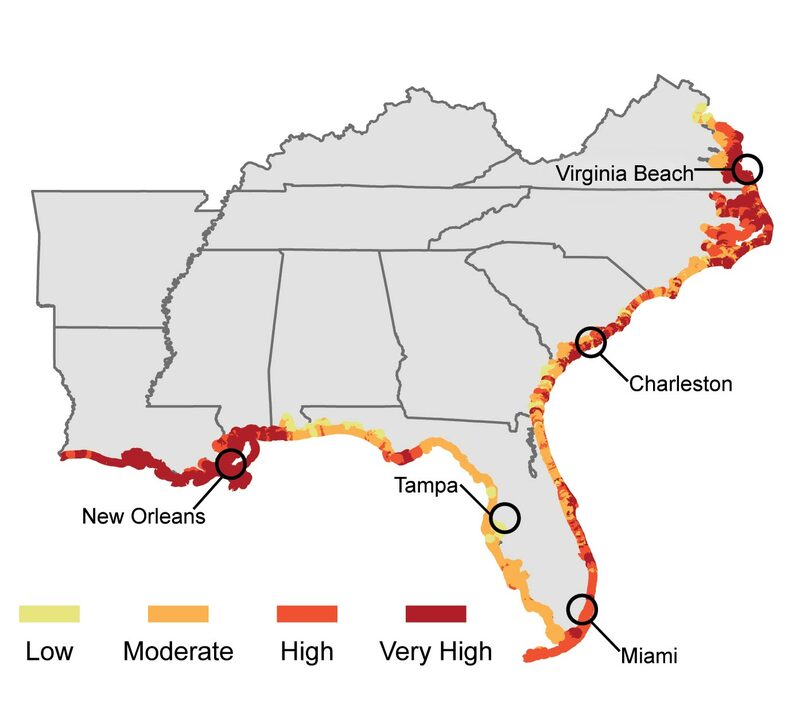 Sea level rise poses widespread and continuing threats to the region’s economy and environment. Extreme heat will affect health, energy, agriculture, and more. Decreased water availability will have economic and environmental impacts. Explore how climate change is affecting the Southeast and Caribbean. Increasing temperatures and the associated increase in frequency, intensity, and duration of extreme heat events will affect public health, natural and built environments, energy, agriculture, and forestry. Decreased water availability, exacerbated by population growth and land-use change, will continue to increase competition for water and affect the region’s economy and unique ecosystems. Temperature projections compared to observed temperatures from 1901-1960 for two emissions scenarios, one assuming substantial emissions reductions (B1) and the other continued growth in emissions (A2). For each scenario, shading shows range of projections and line shows a central estimate. (Figure source: adapted from Kunkel et al. 20131). The Southeast warmed during the early part of last century, cooled for a few decades, and is now warming again. Temperatures across the region are expected to increase in the future. Major consequences include significant increases in the number of hot days (95°F or above) and decreases in freezing events. Higher temperatures contribute to the formation of harmful air pollutants and allergens.6 Higher temperatures are also projected to reduce livestock and crop productivity.7,8 Climate change is expected to increase harmful blooms of algae and several disease-causing agents in inland and coastal waters.9,10,11,12,13 The number of Category 4 and 5 hurricanes in the North Atlantic and the amount of rain falling in very heavy precipitation events have increased over recent decades, and further increases are projected. This map summarizes the number of times over the past 30 years that each state has been affected by weather and climate events that have resulted in more than a billion dollars in damages. 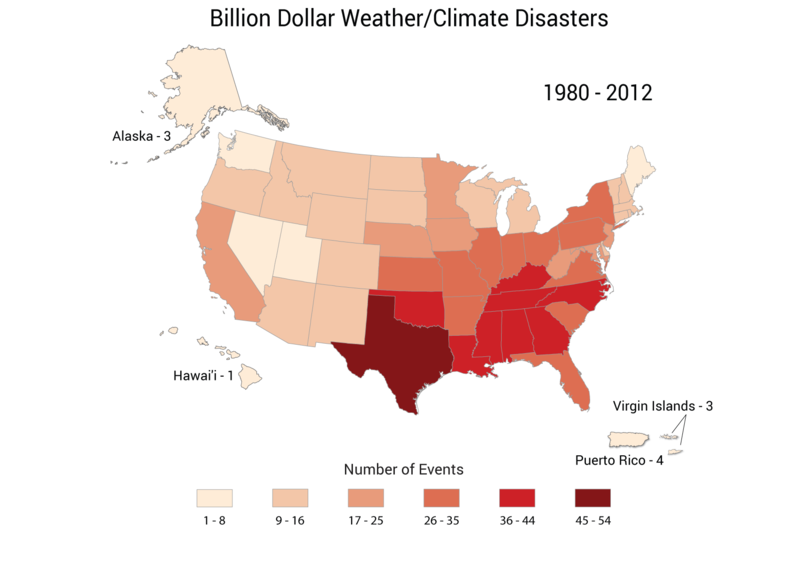 The Southeast has been affected by more billion-dollar disasters than any other region. The primary disaster type for coastal states such as Florida is hurricanes, while interior and northern states in the region also experience sizeable numbers of tornadoes and winter storms. (Figure source: NOAA NCDC2). For another example, see Adaptation for a description of the Southeast Florida Regional Compact’s plans to reduce heat-trapping gas emissions and adapt to climate change impacts.